Still convalescing with my right shoulder--two short sessions at gyms this week. Another Saturday run up Green with Willa, who just turned 11. A good role model for anyone, climbing or not. No big news in climbing recently--not that anything in climbing is big news. 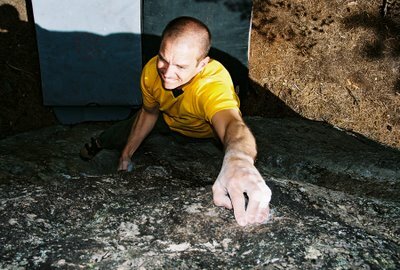 In Boulder, the emphasis is still on bouldering in the Park. Talking with a young climber the other evening, the grade debate came up as it so easily does. I commented that it seems odd that so few world-class international climbers have visited RMNP, which would help give perspective on recent achievements. There are a few very talented climbers around here and two or three who are world class but the scene is very isolated and close-knit which is when it's easiest to persuade each other that everyone is setting a new standard. To give perspective, bouldering 8b+ has been around since the early 90s with Fred Nicole (or Hubble 1990 by Ben Moon) and became standard by roughly 2001. So recent media hype, while fun to read, is roughly 10 years behind the time. Essentially, the sport, despite a great deal of consolidation remains roughly where it was 5 even 10 years ago--the names have changed and not much else. Who will be the next individual to really push things in significant way? I'm not sure it's anyone we see out there right now--it's the vision thing that's the problem. Fred had it, Dave had it, Tommy had it, Chris had it, but everyone else is following each other around, coasting on the group mentality. One other prediction the Front Range has not had another known 5.14 since I added a bolt to connect Primeval and Shine and Daniel freed Prime Time to Shine in 2005. That's a long time. Isn't it time for a Front Range 14+? Another two years, I give it. I enjoy your take on contemporary climbing/bouldering issues like grades, so keep up the good work and, more importantly, get healthy!! !